You can find each regular course of the current semester in the online course catalogue: http://www.tu-freiberg.de/~vover/. The course catalogue of TU Bergakademie Freiberg is available only in German language. To find a course (module), first make sure that the right current semester is active ("Startseite" > "Bitte wählen Sie ein Semester" / meaning: Please choose a semester > e. g. "Sommersemester 2017"). Then click on "Suchen" in the left navigation menu. Type in the title or parts of the title of the desired lecture in the field "Veranstaltung" (event). 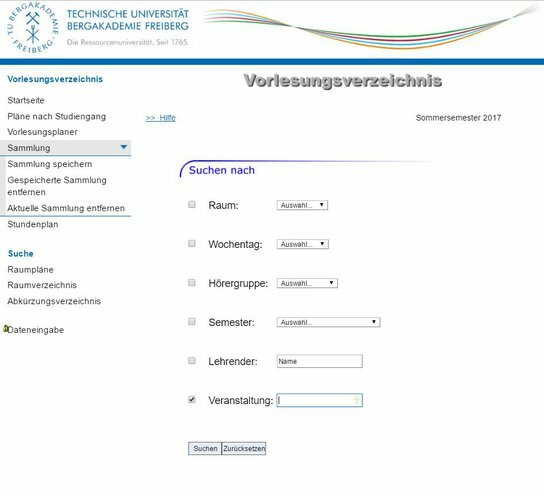 Please deregister from studies at TU Bergakademie Freiberg by filling the form „Application for deregistration“ (see . If you don’t visit Freiberg again you can send the form to me so I will get the signatures from the Faculty and Library. At the end of each semester at TU Bergakademie Freiberg, a programme student has to ask for a Transcript of Records at Student’s Office in Akademiestraße 6. The Transcript of Records displays the results of successfully completed modules, including grades and credit points (ECTS). Please write to Ms Uchlier with your name, matriculation number and a list of the modules you attended successfully at TU Bergakademie Freiberg and you want to appear on your Transcript of Records. Also send her your post address to which the Transcript of Records should be send in case you are not in Freiberg any more when the Transcript of Records has been issued.